There are 855 trillion cubic meters (tcm) of technically recoverable resources, which means that regardless of cost we could get at them, and would last 240 years at the current rate of 3.5 tcm produced per year — but 20 to 40% are sour and very expensive and difficult to produce, reducing the resource to 145 to 195 years. In some fields, contaminants can be found in very high concentrations. This increases investment needs and production costs to the extent that production may even be rendered uneconomic. 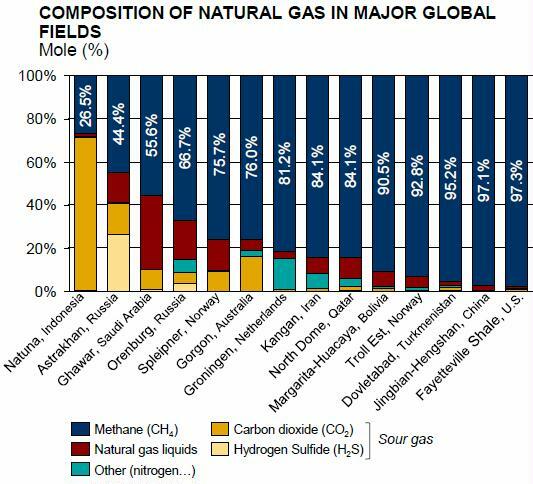 Natural gas rich in hydrogen sulfide (H2S) or carbon dioxide (CO2) is called sour gas or acid gas. CO2 and H2S are both extremely corrosive and H2S is also toxic. When these gases are present, special equipment is needed (e.g. special alloys for tubing and piping) to ensure that the natural gas can be safely transported and processed, prior to being sold. 20-40% of global recoverable gas resources could be considered, to varying degrees, to be sour gas, especially in the Middle East and Central Asia, but also in North America, Australia and Russia. Even if sour gas fields have a long history of successful development in several places, lowering the costs of sour-gas operation is essential if its potential is to be fully tapped. This could be through innovation in gas-separation technologies used in processing plants or more advanced deployment of capture and re-injection, including enhanced oil recovery. This entry was posted in Natural Gas. Bookmark the permalink.